Fathers, partners, sons, brothers, uncles, and friends. Their health matters to us. They’re why we need to have a conversation about mental health — because I worry they’re not talking about it enough. Good mental health is as important as oxygen. You need it to survive. 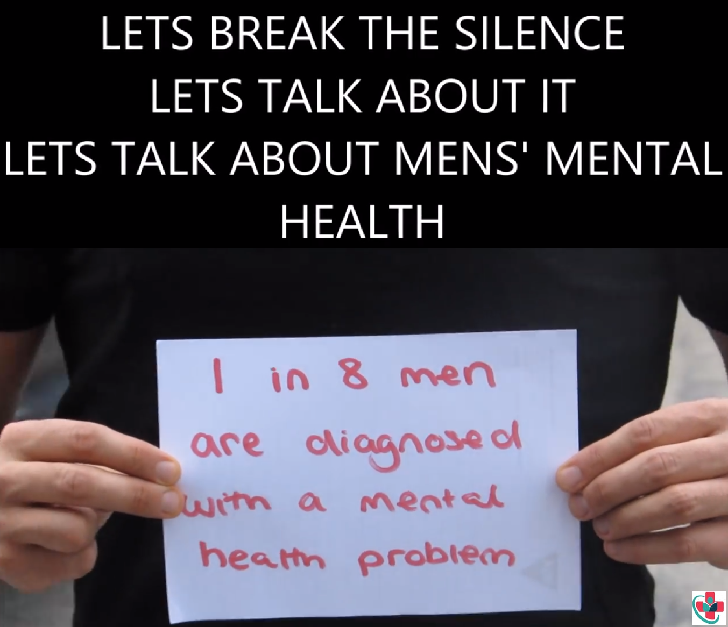 But there are many different reasons why men are less likely to speak up about mental health problems like depression. I know one too many men who have diagnosed mental health issues but do nothing about it because they think admitting it makes them weak. They don’t want to go to the pharmacy and pick up an anti-depressant because they are afraid they will be judged. They don’t want to go to a therapist because they don’t want to share with a stranger. But if they don’t talk about it, it can be tough for friends or family members to know something is wrong. Men don’t always show the signs we often associate with depression, like sadness and hopelessness. Instead, they might appear angry or aggressive, making it easier for doctors and loved ones to miss the signs that something is wrong. As a result, men might miss out on the treatment they need to feel better. Depression can’t be willed away. It’s a serious mental health condition that affects a man’s daily life, including the way he eats, periods of sleep, feels, and thinks. It can also affect his ability to work, go to school, and maintain relationships with friends and family. Depression is NOT a sign of weakness, and it can affect any man, regardless of his age and race or ethnicity. What would cause a man in your life to develop depression? According to the National Institute of Mental Health, it can be a combination of factors. For starters, his genes can play a role. Men who have a family history of depression are more likely to develop it than those who don’t. Environmental stress can trigger depression too. This includes financial problems, the loss of a loved one, work problems, a difficult relationship, a major life change, or a stressful situation. Also, depression can occur in men who have a serious medical condition like diabetes, heart disease, or cancer. Getting an accurate diagnosis and following it up with treatment is essential. Most people need professional help to feel better. Without it, depression can lead to serious consequences, such as trying to self-medicate with drugs or alcohol, or worse — suicide. Suicide is one of the leading causes of death in the U.S., and men die by suicide at rates almost four times higher than women. Unfortunately, a recent report by the Centers for Disease Control shows that suicide rates are on the rise across the nation. The report looked at data from 2015 to compare deaths by suicide among people with and without known mental health conditions. In both categories, men were more likely to die by suicide (84% and 69%, respectively). While depression and other mental health conditions aren’t the only risk factors for suicide, many of the issues that trigger depression can also contribute to suicide. Those include problems with health, money, and work. Substance use and problems in relationships can also contribute to suicide. My message this Men’s Health Month is simple: We need to talk openly about mental health. Suffering in silence isn’t a safe or healthy option for the men in our lives. Check in with them. Ask them how they’re feeling, especially if one of them has experienced a recent event that could trigger depression. Look for changes in his behavior and watch out for depression symptoms. If you think someone you love has depression, offer your support, listen, and be patient. Encourage him to talk to his doctor or a mental health professional, or you can help him find treatment services in his area. Living with depression can feel overwhelming and isolating, so let him know he’s not alone. Help is available, and he can feel better. If you or someone you love is thinking about hurting or killing themselves, get help now. Call 911.